“Nones” are a diverse collection of people, including atheists and agnostics, as well as those who have a mix of religious beliefs and practices but do not identify with a particular faith. While the “nones” are not a religion per se, they are broadly categorized as such because, regardless of their beliefs, they don’t identify with a religious group. Of the 112 countries and territories in which the unaffiliated rank second, Christians are the largest religion in 106. In many of these nations, including the U.S. and most of Western Europe, “nones” are a substantial minority. They make up a quarter or more of the population in the United Kingdom and Germany, for example. 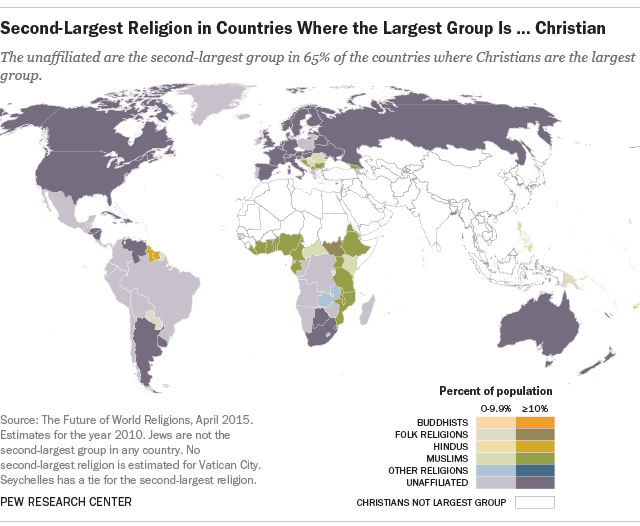 Christians are the second-largest religious group in 43 countries – including in much of predominantly Muslim North Africa and the Middle East – although in many of these states, such as Saudi Arabia and Libya, less than 5% of inhabitants are Christian. Indeed, in many countries, the largest group is far larger than the second-largest group. 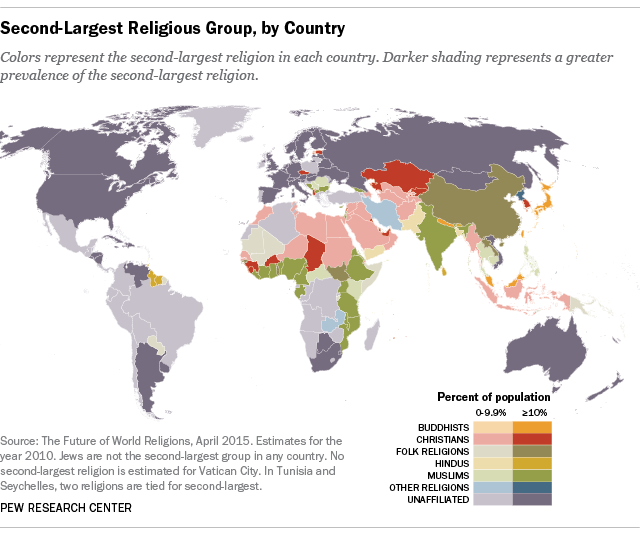 Across all countries and territories in the world, the median share of the country population in the largest religious group is 88%, whereas the median share in the second-largest group is 9%. 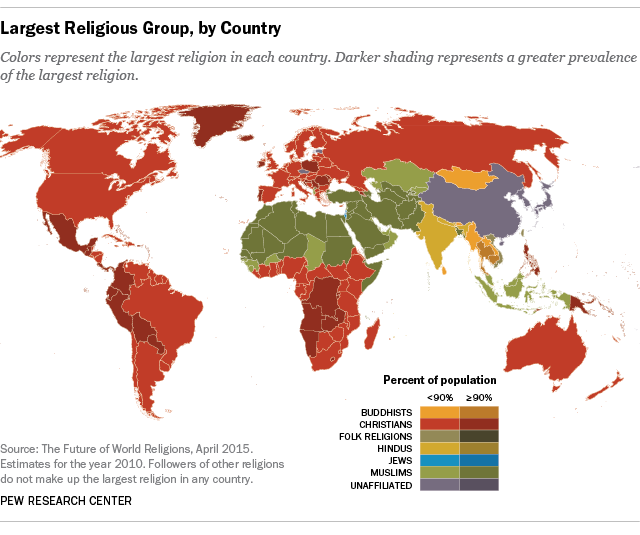 Three-quarters of the world’s people live as part of the largest religious group in their country, while 16% are part of the second-biggest group. 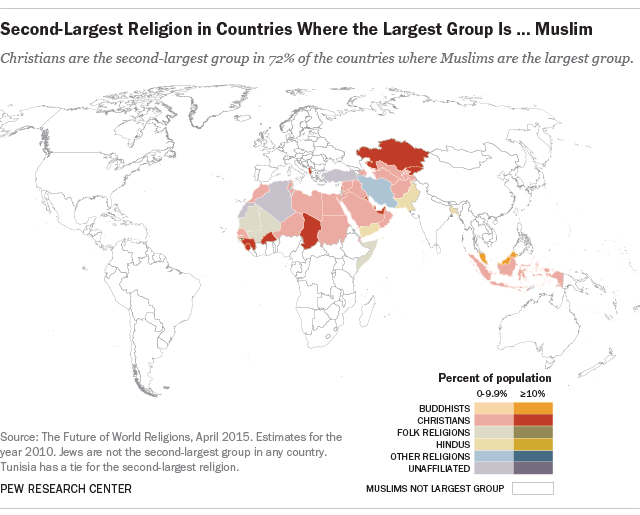 Muslims are the second-largest group in 30 countries. Islam ranks second to Christianity in many African countries, particularly in the sub-Saharan belt of nations that run across the continent. Many of these countries, such as Nigeria and Ethiopia, are situated between the predominantly Muslim Maghreb of North Africa and the more solidly Christian countries in the southern part of the continent. Islam also is the second-largest religion in India, after Hinduism. Adherents of folk religions are the largest religious group in just three countries (Macau, Taiwan and Vietnam), but they are the second-largest group in 23 nations, including China (where “nones” are the biggest group). Hindus, meanwhile, make up the second-largest group in 12 countries, perhaps most notably Pakistan. Buddhists are the second-largest group in seven countries (including Japan). 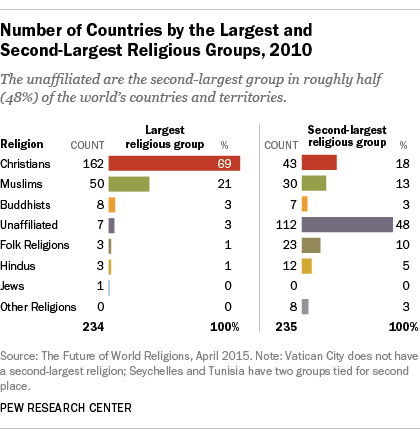 Jews are not the second-largest religious group in any nation. Note: This analysis is based on the eight religious categories used in “The Future of World Religions” report: Christians, Muslims, the religiously unaffiliated, Hindus, Buddhists, adherents of folk religions, Jews and followers of other religions. These results would vary if subgroups within these categories were classified as separate religions. Country and regional religious composition data, along with future composition projections, are available in sortable tables. You can also download a list (Excel file) of the largest and second-largest religious groups in each country. Additional data on country-level religious demography is available at the Global Religious Futures website.